^ a b Jackson, Kenneth T. The Encyclopedia of New York City: The New York Historical Society; Yale University Press; 1995. p. 194. ^ a b Furtwangler, 51. ^ See, e.g. Ralph Ketcham, James Madison. New York: Macmillan, 1971; reprint ed., Charlottesville: University Press of Virginia, 1998. 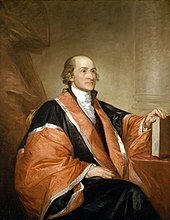 See also Irving N. Brant, James Madison: Father of the Constitution, 1787-1800. Indianapolis: Bobbs-Merrill, 1950. ^ Gunn, Giles B. (1994). Early American Writing. Penguin Classics. pp. 540. ISBN 0140390871. http://books.google.com/books?id=OlphD37HAY4C&. 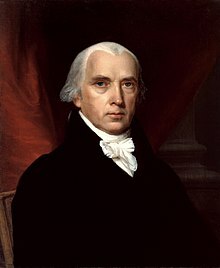 ^ The Federalist timeline at www.sparknotes.com. ^ Henry Cabot Lodge, ed (1902). 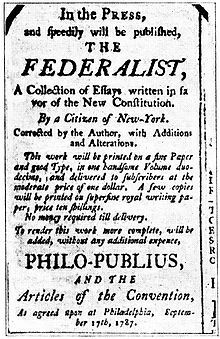 The Federalist, a Commentary on the Constitution of the United States. Putnam. pp. xxxviii?xliii. http://books.google.com/books?id=9S-HAAAAMAAJ 2009年2月16日閲覧。. 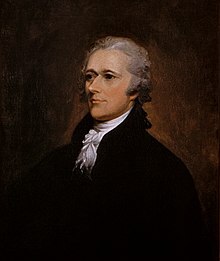 ^ Alexander Hamilton, John Jay, and James Madison (Jacob E. Cooke, ed., The Federalist (Middletown, CT: Wesleyan University Press, 1961 and later reprintings). ISBN 978-0819560773. ^ This scheme of division is adapted from Charles K. Kesler's introduction to The Federalist Papers (New York: Signet Classic, 1999) pp. 15-17. A similar division is indicated by Furtwangler, 57-58. ^ See, among others, a very early exploration of the judicial use of The Federalist in Charles W. Pierson, "The Federalist in the Supreme Court," The Yale Law Journal, Vol. 33, No. 7. (May, 1924), pp. 728-735. ^ Arthur, John (1995). Words That Bind: Judicial Review and the Grounds of Modern Constitutional Theory. Westview Press. pp. 41. ISBN 0813323495. http://books.google.com/books?id=UZu-fuHdnNwC. Adair, Douglass. Fame and the Founding Fathers. Indianapolis: Liberty Fund, 1974. 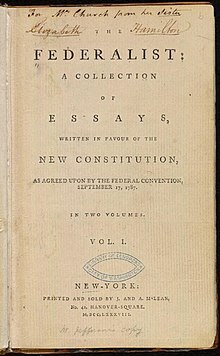 A collection of essays; that used here is "The Disputed Federalist Papers." Gray, Leslie, and Wynell Burroughs. "Teaching With Documents: Ratification of the Constitution," Social Education, 51 (1987): 322-324.